Phillip still isn’t sure how he ended up a counsellor. He gained a degree by the skin of his teeth and thought he’d better use it. The problem is he’s not terribly skilled at solving other people’s problems. Candice and Richard are his most terrifying clients but his client numbers are so dismally low that he’s reluctant to turn them away. Wayne Hope is an actor, director and writer and is widely known for the role of Wayne Kerrigan in the smash hit feature film, THE CASTLE. 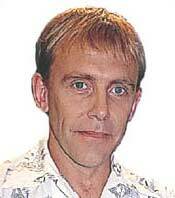 Wayne has worked extensively for the Australian stage, and was a founding member of Chameleon Theatre in Melbourne. His work for the Melbourne Theatre Company includes THREE DAYS OF RAIN, TWELFTH NIGHT and COMEDY OF ERRORS for which he won a Green Room Award. He most recently directed THE BRIDGE for Hothouse Theatre. Wayne featured in three seasons of THE MICALLEF PROGRAM and has appeared in HALIFAX F.P., STINGERS, BLUE HEELERS, ROUND THE TWIST and THUNDERSTONE. His latest work STORIES FROM THE GOLF is a 13 part series of comic shorts for SBS co-written with his wife Robyn Butler (WELCHER & WELCHER). He will also be seen in the feature JOSH JARMAN. Says Wayne, “Phillip is a therapist who, quite possibly, is more confronted by the counselling process than many of his clients”.